If you’re looking to let off some steam, the Bop the Beetle game might be the release you need. Despite being touted as “more fun than a picnic” in its advertising, the game’s appeal lies in the fact that it allows players to channel their inner caveman and smash, err… bop things. 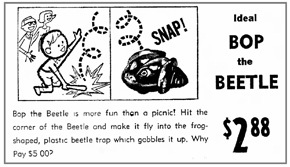 Released in 1962 by Ideal, Bop the Beetle consists of five plastic pieces – two long, solid tubes (the boppers), two different coloured beetles, and a large, clam-shaped frog. The limited number of pieces makes it easy to setup and play the game indoors and out. Player first place the 19 ½-inch frog on the ground with each beetle positioned a fixed distance away from it. The two halves of the frog are joined via a hinge at the rear, and players lock it in an open position. The game begins with each player bopping the beetle with a beetle bopper. Bopping the corner of the beetle causes it to fly up in the air. 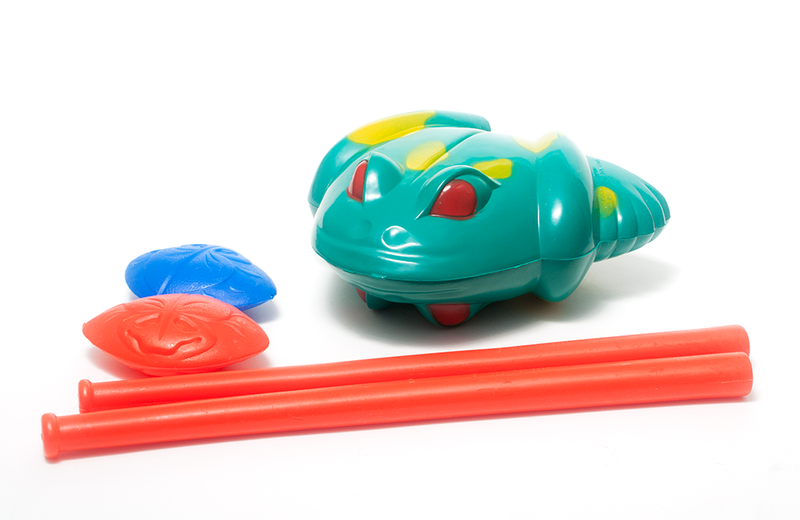 The first player to successfully bop their beetle into the mouth of the frog will cause his mouth to slam shut in a game-winning move.